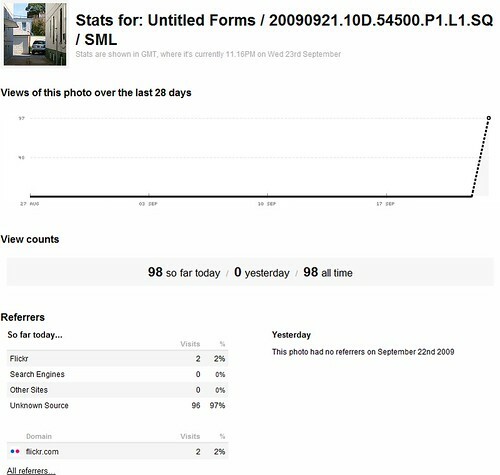 SML Pro Blog: Bug in Flickr Stats Server? Bug in Flickr Stats Server? I have noticed some oddity on my Flickr Stats recently. This problem was particularly noticeable since Flickr's recent server outages happening in August. I created a related forum post about this: Flickr: The Help Forum: Bug in Flickr Stats Server? I have noticed that when I posted my photos past a certain hour (usually after 2am local time EST), my photos would pick up an abnormal amount of views all within minutes after uploads. According to the Flickr Stats Referral detail, they all come from Unknown Sources, and I can't quite get a grasp at what's going on. If those were actual views, I have no problem with it, but just how some photo of a back alley accumulate 98 views over a minute on Flickr is close to impossible knowing my own stats history. This is definitely a problem. I haven't tweeted about this photo, nor have I shared this anywhere with any social media sites, you can't blame bit.ly for this. Bad data makes it impossible to evaluate actual performance of the photo. If any of you are having the same problem, please reply to the forum post: Flickr: The Help Forum: Bug in Flickr Stats Server? as Flickr appears to think that it is a localized problem which happens to only a few of the users. As far as I know it, this does not happen to me personally. I know of a few Flickr contacts who are having the same problem as well.